Videogames designed to help the minds of older people to remain alert and active. It’s a commonplace that physical activity can keep older people healthy. Although the body deteriorates with age, regular exercise, even light exercise, can keep it in better condition for longer. Intuitively we think the same might be true of mental activity. If we exercise the brain by getting it to perform tasks, maybe we can keep it more active and remain more alert as we grow older. Now there’s a report about video games specifically designed to aid cognition and memory in older people. Video games to improve mental skills are not new, but some question whether they improve our ability to cope with the world, as well as improving our video-gaming skills. Neuroscientists at the University of California, San Francisco, have developed NeuroRacer, a game that requires its players to multitask. They must press a button to respond to different symbols that appear, while also using a joystick to drive a car along a winding, hilly track. Two groups were tested playing the game. 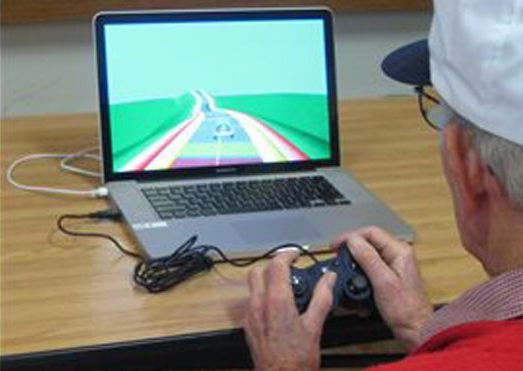 174 players of various ages played it wearing electroencephalography (EEG) caps that read electrical activity in their brains, then 16 older people aged 60 to 85 took the game home to play on laptops three times a week for a month before returning to play it in the lab again wearing the EEG caps. This does seem to suggest that playing the game had produced changes in the brain that improved its abilities. Indeed, further tests showed that the test group performed better at memory and cognition tasks. All of this came from only a few hours of play, which suggests that this might be a promising way of enabling older people to stave off the mental decline that often accompanies ageing, and remain independent for longer. For kids or mature adults new to gaming Minecraft can be as easy or as challenging as you choose to make it. It demonstrates and allows perfect logic and humour in a setting that has some necessary and forgivable constraints on real world physics and ecology.